BioBag® compostable bin liner bags are the original, strongest, best quality and biggest selling brand worldwide. A practical solution to help keep your kitchen food waste bin clean and hygienic. The liner bags feature a sealed base for added strength. This design helps to prevent the liner bag breaking when full of food waste without affecting the overall capacity of the bag. 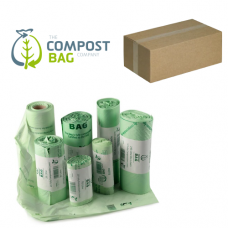 Our food waste compost caddy and bin liner bags are manufactured using materials derived from corn starch and other plant extracts making them 100% compostable and biodegradable. They are fully compliant with the European standard EN13432 and as such are approved for use with council food waste recycling schemes. Liners should be stored in a cool dry environment. Liners will not biodegrade in storage, biodegradation will only be initiated in a compost environment in the presence of micro-organisms, humidity and warmth. However, over time, the material may lose some of its mechanical properties and weaken. To ensure optimum performance we would recommend purchasing no more than you would expect to use over a 12 month period. We believe our prices are the lowest available on the Internet. Please let us know if you find the same products at a lower price, including delivery charges, from any other Internet business web site and we will guarantee to match it. Excludes special offers. Copyright © 2019 Items Direct Limited. All rights Reserved.